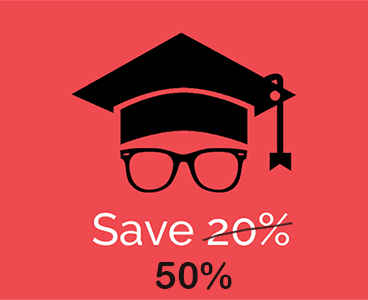 Coolutils offers great edu discounts to all students and teachers. Schools and colleges are welcome to use our award-winning apps to process PDF, Word, XLS files or images. If you are currently enrolled in a college or university, you can apply for the student discount today. It works worlwide! It's easy to apply for a discount. If you are holding an ISIC card, you validate your number and get the coupon automatically. If you have a scan of your student ID, you can still get the discount. Email it to us and we will get back with the 50% student software discount. 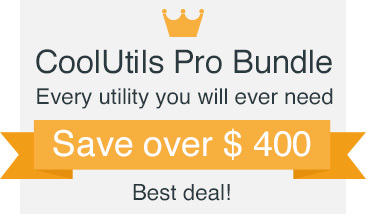 50% to all Coolutils apps! *home license for personal use only. CoolUtils offers a wide range of apps to help you in your study. Preparing an e-book or an essay? Combine several PDF files into one professional looking document with a Table of Contents and bookmarks that would lead to chapters. You can also add your own cover page. PDF Splitter will help you with the reverse task - get individual pages out of a multi-page PDF file. Blank pages can be a nuisance. Our unique Tiff Pdf Cleaner will detect and delete blank pages from your files. You will love deskew PDF option too! If you deal with scanned books, invoices or other documents in TIFF or PDF formats, CoolUtils tools will automate the process for you. CoolUtils offers applications to convert audio from and to many popular formats (MP3, AAC, MP4, WAV, WMA, OGG, FLAC, etc.) Once you've converted it you can also use CoolUtils applications to burn CDs and manage your collection. Archive old emails from Outlook, Gmail, Windows Mail or Thunderbird by saving them as PDF or DOC files. We have all kinds of email converters to help you convert your emails to non-email formats. They also work great for freedom of information requests! Today we deal with hundreds of files in different formats. CoolUtils Converters are at your hand to convert any file formats. PDF, HTML, XLS, DOC, TXT, CAD are just the tip of the iceberg. CoolUtils converters are known for built-in wizards to help beginners make all the settings. CoolUtils is proud of PrintMaestro - a tool to produce all kinds of reports. It will print and export the content of your directories to PDF or HTML files. I.e. it easily creates version info reports (Company Name, Version Info, Copyright, Product version). Buying educational discount software from Coolutils you are guaranteed to get the powerful solutions for a fraction of the regular price. Can I get the edu discount if I study abroad? Yes, just send us your student or teacher card. We support students and teachers worldwide, not in one particular country. Can I get the discount for all students in my class? Sure. If you need 5+ licenses, contact our sales team. We will offer the best licensing scheme. How many machines can I put Coolutils apps on? One registered copy of CoolUtils software may be installed by a single person who uses the software personally on one or 2 computers (for example, on pc and a laptop).